Possibly Jacques Amelot du Quillou, marquis de Mauregard [1602-1688, later marquis de Gournay], by c. 1668. possibly Henri de Guénégaud de Fresne, marquis de Plancy et de Guercheville, comte de Montbrison [1609-1676]. possibly marquis de Lassay; (his sale, Joullain fils, Paris, 22 May 1775, no. 43). George Granville Sutherland-Leveson-Gower, 2nd duke of Sutherland [1786-1861], Stafford House, London; by inheritance to his son, George Granville William Sutherland-Leveson-Gower, 3rd duke of Sutherland [1828-1892], Stafford House; Cromartie Sutherland-Leveson-Gower, 4th duke of Sutherland [1851-1913], Stafford House; (his estate sale, Christie, Manson & Woods, London, 11 July 1913, no. 34); (Thos. Agnew and Sons, Ltd., London); sold 14 July 1913 to the Dowager Duchess Sutherland [presumably the 4th Duke's widow]; Trustees of the 4th duke of Sutherland; sold 7 January 1948 to (Thos. Agnew and Sons, Ltd., London); sold 5 May 1949 to the Samuel H. Kress Foundation, New York; gift 1952 to NGA. In documents dating before the 1830s, it is difficult to identify with any degree of certainty which version of The Holy Family on the Steps is being described, the painting owned by The Cleveland Museum of Art or the NGA painting. The NGA painting can be identified securely only after it entered the Duke of Sutherland collection in the 1830s. For the most up-to-date study of the provenance based on all available information, see Roger Diederen, "Provenance: "Holy Family on the Steps," Cleveland Studies in the History of Art 4 [Volume accompanying the exhibition Poussin's 'Holy Family on the Steps' at The Cleveland Museum of Art, 1999-2000], 1999: 177-184, and note 5 below. Concerning Jacques Amelot's possible ownership of the Washington painting, see Diederen 1999, 178. The NGA painting is identified as the one in this sale on the grounds that the measurements of the described painting match more closely those of the NGA version than those of the version of the painting in the Cleveland Museum of Art; see Diederen 1999, 179. Diederen 1999, 180. Anna Brownell Jameson, Companion to the Most Celebrated Private Galleries of Art in London: The Collection of the Duke of Sutherland at Stafford House, styled The Sutherland Gallery, London, 1844: 197, no. 74, described the painting as in the Duke of Sutherland collection; Colin Eisler, Paintings from the Samuel H. Kress Collection: European Schools Excluding Italian, Oxford, 1977: 277-278, suggests that the duke acquired the painting between 1833 and 1837; Anthony Blunt, The Paintings of Nicolas Poussin. A Critical Catalogue, 2 vols., London, 1966: 39-40, states that it was in the Sutherland collection by 1844 based on Jameson's publication. Marijke Booth and Venetia Harlow, archivists at Christie's and Agnew's, respectively, kindly provided the provenance of the painting from the 1913 sale through the 1949 purchase by the Kress Foundation. The painting has two stock numbers in the Agnew's records, 4329 in 1913 and 9766 in 1948. See e-mails of 18 December 2008 and 9 January 2009, to Anne Halpern, in NGA curatorial files. Obras Maestras de la National Gallery of Art de Washington, Museo Nacional de Antropología, Mexico City, 1996-1997, unnumbered catalogue, 54-55, color repro. 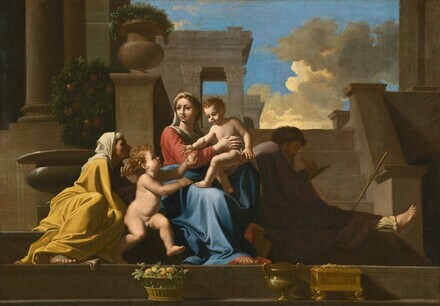 A Painting in Focus: Nicolas Poussin's `Holy Family on the Steps', The Cleveland Museum of Art, 1999-2000, pl. 5. Paintings and Sculpture from the Kress Collection Acquired by the Samuel H. Kress Foundation 1945-1951. Introduction by John Walker, text by William E. Suida. National Gallery of Art, Washington, 1951: 218, no. 97, repro., as by Poussin. Walker, John. National Gallery of Art, Washington. New York, 1956: 40, repro., as by Poussin. Cooke, Hereward Lester. French Paintings of the 16th-18th Centuries in the National Gallery of Art. Washington, D.C., 1959 (Booklet Number Four in Ten Schools of Painting in the National Gallery of Art, Washington, D.C.): 20, color repro., as by Poussin. Paintings and Sculpture from the Samuel H. Kress Collection. National Gallery of Art, Washington, 1959: 339, repro., as by Poussin. Walker, John, Guy Emerson, and Charles Seymour. Art Treasures for America: An Anthology of Paintings & Sculpture in the Samuel H. Kress Collection. London, 1961: 139, color fig. 130, as by Poussin. Cairns, Huntington, and John Walker, eds., Treasures from the National Gallery of Art, New York, 1962: 104, color repro., as by Poussin. Walker, John. National Gallery of Art, Washington, D.C. New York, 1963 (reprinted 1964 in French, German, and Spanish): 204, repro., as by Poussin. Summary Catalogue of European Paintings and Sculpture. National Gallery of Art, Washington, 1965: 105, as by Poussin. Cairns, Huntington, and John Walker, eds. A Pageant of Painting from the National Gallery of Art. 2 vols. New York, 1966: 2:290, color repro., as by Poussin. European Paintings and Sculpture, Illustrations. National Gallery of Art, Washington, 1968: 92, repro., as by Poussin. European Paintings: An Illustrated Summary Catalogue. National Gallery of Art, Washington, 1975: 274, repro., as by Poussin. Eisler, Colin. Paintings from the Samuel H. Kress Collection: European Schools Excluding Italian. Oxford, 1977: 274-280, fig. 251, as by Poussin. Pope-Hennessy, John. "Completing the Account." Review of Colin Eisler, Paintings from the Samuel H. Kress Collection, London 1977. Times Literary Supplement no. 3,927 (17 June 1977). Walker, John. National Gallery of Art, Washington. Rev. ed. New York, 1984: 313, no. 413, color repro., as by Poussin. European Paintings: An Illustrated Catalogue. National Gallery of Art, Washington, 1985: 319, repro., as by Poussin. Conisbee, Philip, et al. French Paintings of the Fifteenth through the Eighteenth Century. The Collections of the National Gallery of Art Systematic Catalogue. Washington, D.C., 2009: no. 84, 388-395, color repro.